Plugging high-end gaming desktop hardware into a laptop may seem like a crazy idea, but CybertronPC has pulled it off. It's hard to believe the CLX Osiris 17 and 17x PCs from CybertronPC are actually laptops when when you read the basic specifications. Don't expect much battery life from these desktop-replacement laptops, which have 17-inch screens. The Osiris 17 can be configured with Intel's "Skylake" Core i7-6700K, a high-end desktop chip that can be overclocked to crank up gaming performance. The Osiris 17x model can also be configured with up to two Nvidia GeForce GTX 980 graphics processors, which are commonly found in SLA (scalable link interface) configurations in desktops. Osiris 17 and 17x can support up to 64GB of DDR4 memory, which is better than gaming laptops available today. The laptops have 1080p displays, which is poor quality, but the goal is for users to attach external peripherals like speakers, keyboards, mice and monitors. The laptops have two Ethernet ports, display ports and more USB ports than average laptops. Packing such high-end components into a laptop requires re-engineering a motherboard, but can also be dangerous. The high temperature and heat generated could affect functionality or melt components. But the thick laptop has a giant vent at the back to dispose of the heat. Questions remain as to how far CybertronPC recommends pushing the performance of CPUs and GPUs, which generate the most heat. Desktops have power supplies and fans to dissipate heat, but there must be a limit on the amount of heat these laptops can generate and dissipate. CybertronPC announced the new machines Friday, but details were sparse, and the company didn't immediately respond to questions about pricing, availability and full specifications of the Osiris 17 and 17x. For those who want a true mobile gaming, CybertronPC has also introduced the lightweight CLX Anubis gaming PC. The laptop can be configured with Intel's latest quad-core Core i7 6700HQ processors, which started shipping this week. The CPU can be paired with an Nvidia GeForce GTX 970M mobile GPU. A 15.6-inch model of the Anubis can be purchased with a 4K screen, while the 17-inch laptop has a 1080p display. 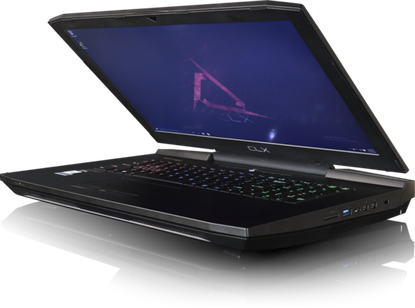 The Anubis is comparable to gaming laptops from companies like Alienware.